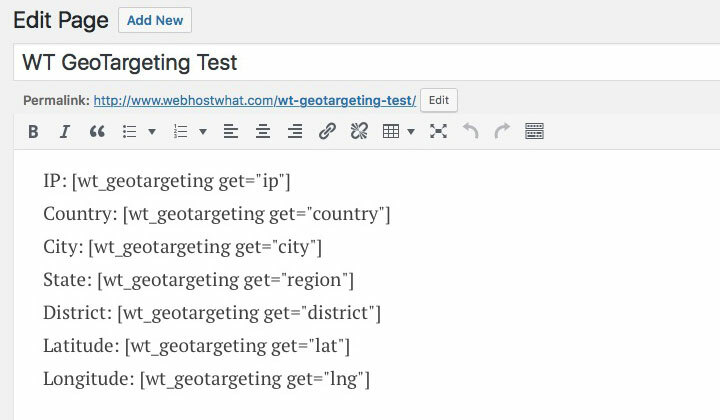 This is my review of the WT GeoTargeting plugin for WordPress; a Russian content geolocation tool by Roman Kusty — and a user guide in English. In my experience the plugin is easy to use without Russian language skills. Free but very basic & based on less reliable ip2nation IP database. Many users are reporting that the plugin doesn’t work and author is planning on paid version. Feature rich plugin; accurate MaxMind database – price based on use. You can download either the free basic version or pro/advanced version that costs 800 Russian rubles or roughly 10 US dollars — on this page. Green button Скачать is Download; blue button Купить is Buy. The biggest difference with basic and advanced is that basic is restricted to the Russian IpGeoBase database which is limited to Russian IPs only. 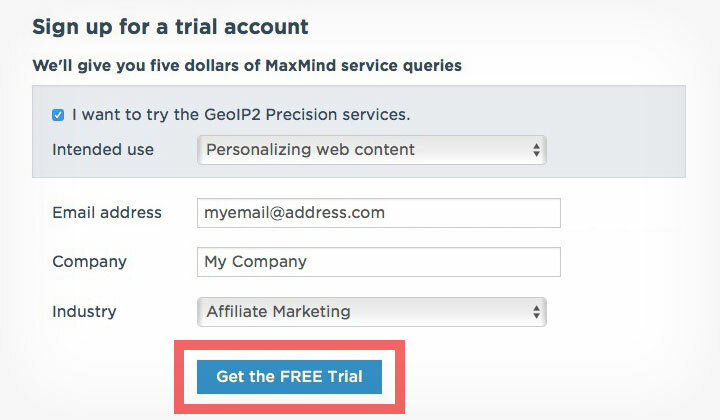 Going advanced will give you the ability to use the MaxMind database for accurate, world-wide IP location detection — which needs to be paid for separately. Both will give you access to all the shortcodes for location targeting. Also worth mentioning is that paying for the product will give you good support and the author is willing to personally fix your site if needed. Fill in your name, email & select the “Оплатить” — “Pay Now” button. 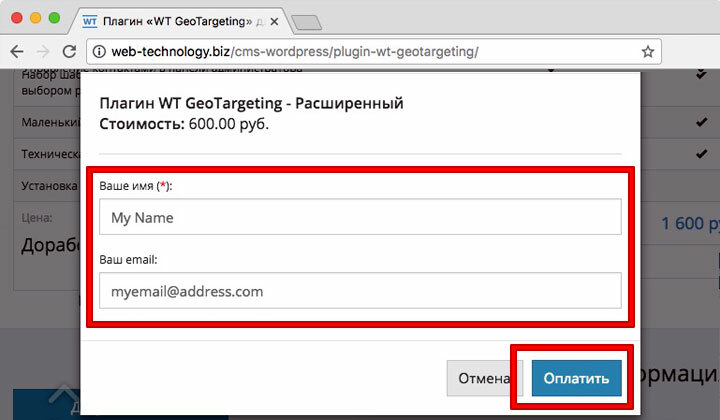 WT GeoTargeting – Расширенный: WT GeoTargeting Plugin – Advanced. Стоимость: 600.00 руб. Cost: 600 Russian Rubles/10USD. 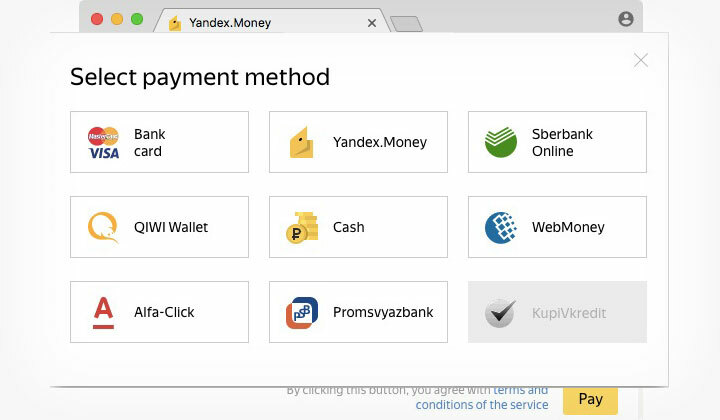 A possible problem for non-Russian customers is that payment is through Yandex.Money — one of the biggest online payment systems in Russia. At the moment Yandex.Money accepts credit cards from a very limited range of countries; post-soviet states are mostly supported in my experience. Another alternative is WebMoney which accepts payments through bank transfer in Europe. But you need to submit your ID scan for registration and the interface can be pretty complicated even thought in English — I would suggest contacting the author of the plugin to ask for alternative payment methods. Once payment is completed you will get an e-mail with download instructions. 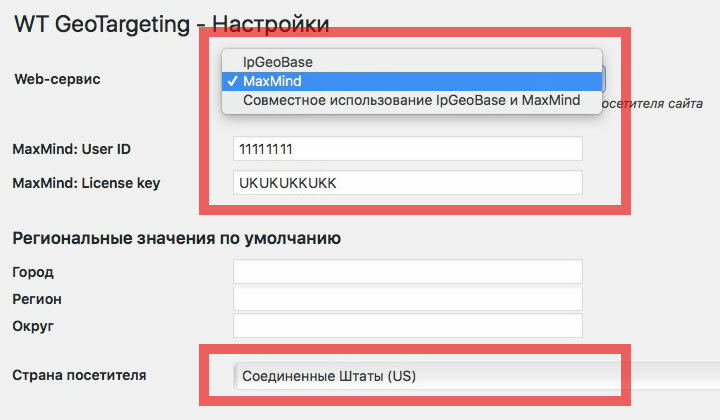 The plugin options are to use IpGeoBase, MaxMind or both in combination for IP location detection. Likely you will be needing MaxMind if outside of Russia. You can use this link to register an account and get a free trial. Fill in your details and proceed with “get the free trial“. 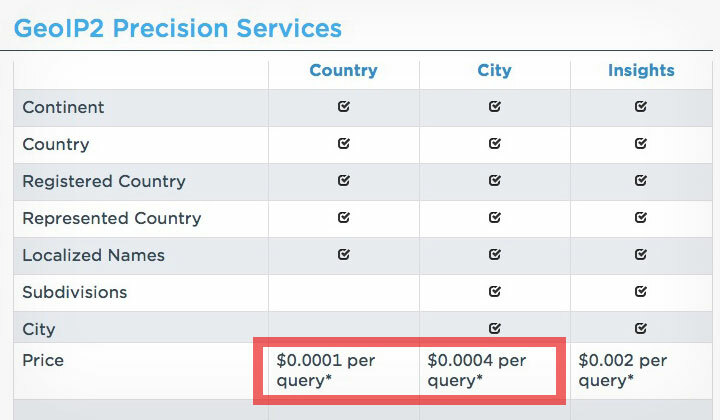 The basic pricing is $0.0001 per one query or page load for country data only or $0.0004 per query for city location information. Country geolocation is significantly cheaper. Also; bots are not included as they are automatically ignored by the plugin (set to default country). 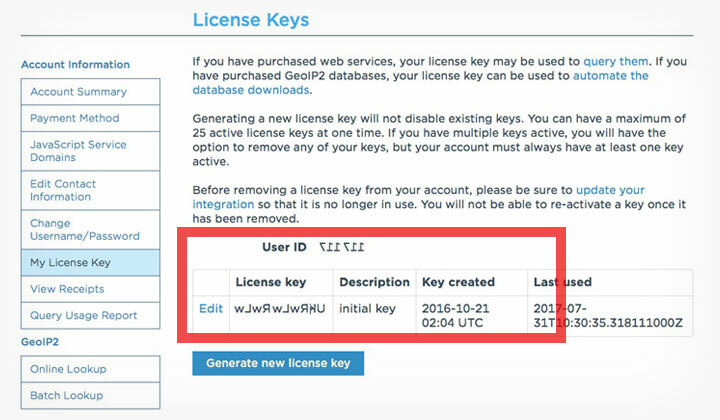 Next go to “My License Key” section to generate a new license key. Also take note of your user ID number. Once you have your MaxMind credentials you can activate the plugin. Upload the .zip file and activate WT GeoTargeting Pro. I initially got an error message but it’s safe to ignore — please, navigate to the plugin settings in dashboard with the above link. First option is to select which database you want to use and fill in your MaxMind credentials; User ID & License Key as generated above. Also select the default country below it. Names are in Russian but end in universal two-letter country codes. This means that if the country of an IP addresses cannot be detected it will show content based on the default country setting. Now you are ready to test some of the functions of the plugin. Most of the documentation, and examples of parameters is on this page and you can easily translate it with Chrome or Google/Bing online. These are the possible get values. Note that Country is displayed as a two letter country code; city & state is displayed in Russian. This is a typical way to show different content based on visitor location. In this case content will depend if visitor is in the US or a country other than US. Biggest problem I had with the current version (1.5.7 at the time of writing) is the lack of support for multiple countries with one shortcode; ex: country_show=”US,CA,UK”, etc. But I have already asked the author for this feature and you can vote for it here (just press thumbs up) — hopefully it will be available in future versions. Geolocation information is automatically stored in browser cookies for a week — this prevents unnecessary api requests. You need to clear the cookies to fetch the updated location; even if IP address chances. Also you need to disable cache for the content to refresh for each visitor. In case it helps someone I’m attaching the support questions I’ve submitted to the author via WordPress.org plugin support page. I have recently purchased the advanced version of WT GeoTargeting plugin for WordPress and have a few issues with it. I am using the MaxMind database only to identify the country location of a visitor, and $5 of MaxMind credits ran out in just three days. This is with an average 200page views/day. What is the possible reason for this? Is the plugin using the MaxMind database for bot visits and is there a way to avoid this from happening? Because I am using multiple shortcodes to display content in one page; does this use one or multiple API requests per one page visit? At the moment of visitor localization, third-party services are accessed only once – during the first visit. If the localization has been successful, the data are structured according to the JSON format and stored in the cookie’s wt_geo_data variable on the user end. During any following visits, the location is determined based on the data stored in the cookie. It is worth noting that user verification is performed prior to access third-party services, in order to filter off web crawlers. The verification is performed by searching for key-words occurrence in the User-Agent heading. Key words for web-crawler filtering: rambler, googlebot, aport, yahoo, msnbot, turtle, mail.ru, omsktele, yetibot, picsearch, sape.bot, sape_context, gigabot, snapbot, alexa.com, megadownload.net, askpeter.info, igde.ru, ask.com, qwartabot, yanga.co.uk, scoutjet, similarpages, oozbot, shrinktheweb.com, aboutusbot, followsite.com, dataparksearch, google-sitemaps, appEngine-google, feedfetcher-google, liveinternet.ru, xml-sitemaps.com, agama, metadatalabs.com, h1.hrn.ru, googlealert.com, seo-rus.com, yaDirectBot, yandeG, yandex, yandexSomething, Copyscape.com, AdsBot-Google, domaintools.com, Nigma.ru, bing.com, dotnetdotcom. After credits ran out; the page of the WordPress post becomes blank or there is an error message which breaks the whole website (see here) when I try to enable to plugin. Is it possible to have it just revert to default country instead? As for the third question, to fix this kind of bug I need to reproduce it. If you will grant me access to your website, I can correct everything. Could we please have this feature? Or is there another way to include and exclude content based on multiple countries? Other than that your plugin is great — thank you in advance! As for the fourth question, the construction you have provided will not work properly at the moment as it is not possible in the current version. If you would like to make a proposal regarding the plugin improvement, please, use the Reformal system. A more flexible code construction can be written in topic templates using PHP language. An advanced plugin version includes templates and examples of their use. Thank you! I think it would be better if you could use the free MaxMind’s “GeoLite City” database file (like in Piwik Analytics for example). I made a quick guide for your plugin in English; you can see it <<here>>. Feel free to link to it if you want. I gave some purchase instructions; but Yandex.Money can be difficult for foreigners. WebMoney supports bank transfer in Europe but it’s very complicated. Also I have requested for the “multiple countries“ feature <<here>>. Comments, questions are welcome but since I am no longer a user of the WT GeoTargeting plugin and neither the author; I might not be able to answer. With experience of traveling and working in different parts of the world — bringing insight into specific web hosting & internet related needs. BTW! Some of posts, reviews & guides contain affiliated links that pay out commission for referrals. It's free of extra cost to blog readers and helps to reward my efforts. I humbly thank you for supporting me.